This with a list of acknowledged bugs almost as long as my arm. Yeah, I think somebody read Susan’s Hey 1809, we need to talk. I’m emphasizing this to see if anyone else has hit the same problem. @GreatAndPowerfulTech reports that installing the 18362 build of Win10 version 1903 trashed all the data on his SD card, and re-assigned the drive letter. 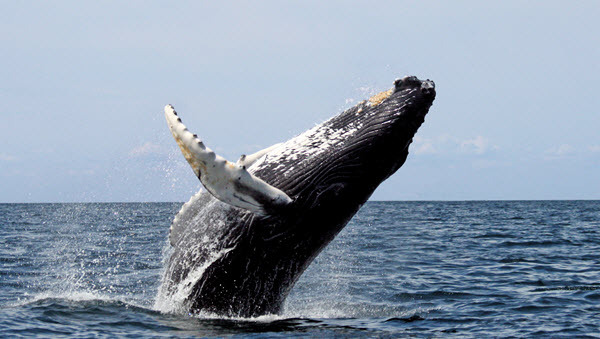 Isolated incident, or harbinger of an 1809 redux? When I originally saw this, I ignored it. Microsoft knows what I feel about the Windows update “experience.” In a nutshell: Way too many, poorly tested, utterly mis-managed, disastrous. Win10 1809 may finally be breaking the downward spiral, but it’s too early to tell. At Susan’s urging, I took another look at Dona’s request. The questionnaire isn’t about the infernal Windows update experience. Microsoft is asking questions about the Windows update history site. That’s a horse of a completely different color. Truth be told, I’m a huge fan of the massive improvements in patch documentation. In the past six months, Microsoft’s gone from obfuscation and dodging to something approaching openness and honesty. The lists of individual patches is a joke – there are so many of them that your scorecard needs a scorecard. But the update history pages are, suddenly, quite worthwhile. Your opinion may vary, of course, which is why I urge you to take the survey. Somebody took over my dormant Google account. What should I do? This is a real-life problem. Several years ago I registered a domain, woodyswindows.com. I set up some email addresses using that domain, but didn’t do anything else with it. A couple of years ago, I let the domain registration lapse. 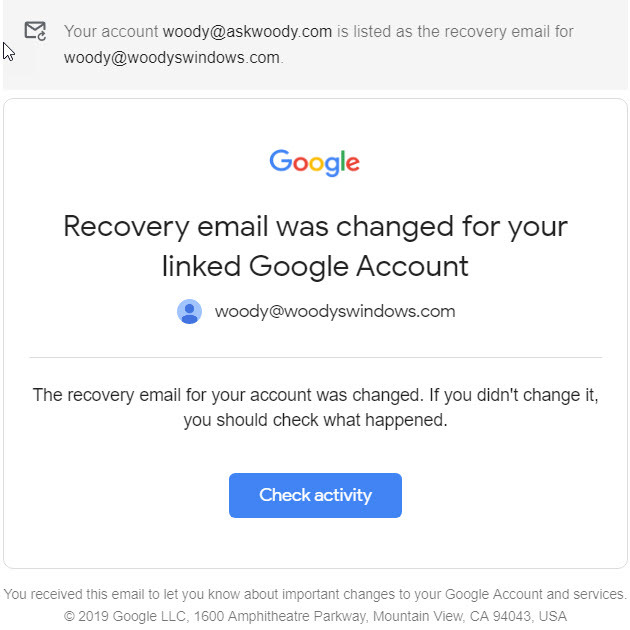 Shortly after, I was informed that somebody had changed the recovery email for woody@woodyswindows.com. Naturally, I clicked the Check activity link. 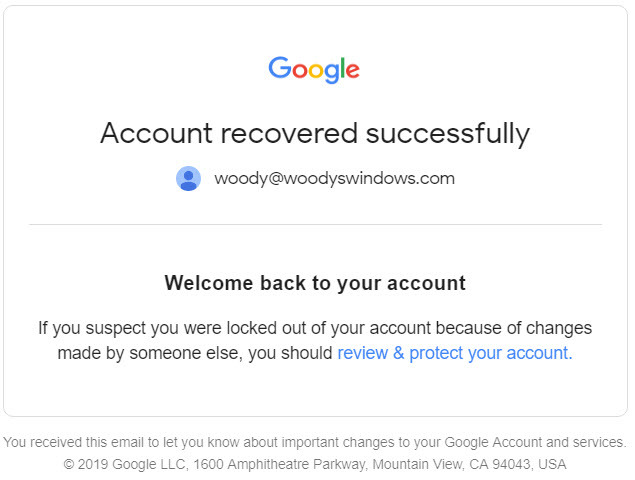 I was asked to log in to my Google woody@woodyswindows.com account – and at that point I discovered that I didn’t have the password. Either I forgot it (unlikely) or it had been changed. Er, recovered, I guess. Somebody managed to take over my old (dormant) Google account, change the password, and lock me out of the recovery email. And I can’t get in to change anything back. Any advice? woodyswindows.com is deader ‘n a doornail. Is this worth pursuing? If not, why not? One password, found in an employee repo on the code sharing, allowed the researcher to access an email account used by internal developers and engineers to share nightly builds of apps, drivers and tools to computer owners. This specific security breach wasn’t directly responsible for the ShadowHammer infiltration, but it demonstrates an incredible lack of concern over simple security procedures. Günter Born has additional analysis on his site. I posted this earlier to the Patchmanagement.org listserve and was urged by Crysta to post it here as well. Dear 1809. You are about to be replaced in the hearts and minds of patchers by your younger version 1903. And yet you keep acting like you aren’t ready for business. Take your March patching release. All your other older brothers have had a preview release come out on the C week (third Tuesday). You however, have been aloof and haven’t released your C/D week update this month. Last month you released your C/D week for February in the month of March. So can we settle down and act like you are ready for Business please? You promised a fix for the Audio bug introduced earlier this month. “Microsoft is working on a resolution and estimates a solution will be available in late March 2019.” Well it’s late March and still no fix. My big beef with your tardiness is that it makes determining when a zero day patch has been released harder. Please settle down and release your updates on Tuesdays, along with your older brothers. Thank you. Wit hWin10 1903 around the corner — some corner — now’s a very good time to set your Win10 machine so it won’t upgrade itself to 1903, no way, no how. Full step-by-step instructions coming up in Computerworld. P.S. As Patch Lady Susan notes, now’s a very good time to download and squirrel away a clean copy of Win10 1809, just in case you might want it some day.